Continuing their growth as Australia’s leading Aboriginal label, Bad Apples Music have announced their latest cultural exchange partnership with Los Angeles based, Artivist Entertainment – founded by Aloe Blacc and Maya Jupiter. With a shared commitment to supporting artists dedicated to using their art for positive social transformation, Bad Apples Music will host Native American singer/songwriter, rapper and spoken word artist Calina Lawrence, when she heads down under to perform in Sydney & Melbourne, including a performance with Bad Apples Music presents: Music For The Mob for Brunswick Music Festival. An enrolled member of the Suquamish Tribe, Calina Lawrence was born and raised within her Indigenous culture in the Pacific Northwest area of Washington State. Her musical career and activism have remained mutually exclusive since the beginning, always lending her voice to the preservation of Suquamish traditions while she explored her love for many contemporary genres. Having released her debut album Epicenter in 2018, Lawrence’s R&B, soul and spoken word fused artistry dedicates itself to addressing social injustices globally, including racial injustice, police brutality, climate injustice, suicide prevention, violence against women, and many other causes. Lawrence will play shows in Sydney and Melbourne, including a performance with the recently announced Music For The Mob at Brunswick Music Festival on Sunday, March 17. 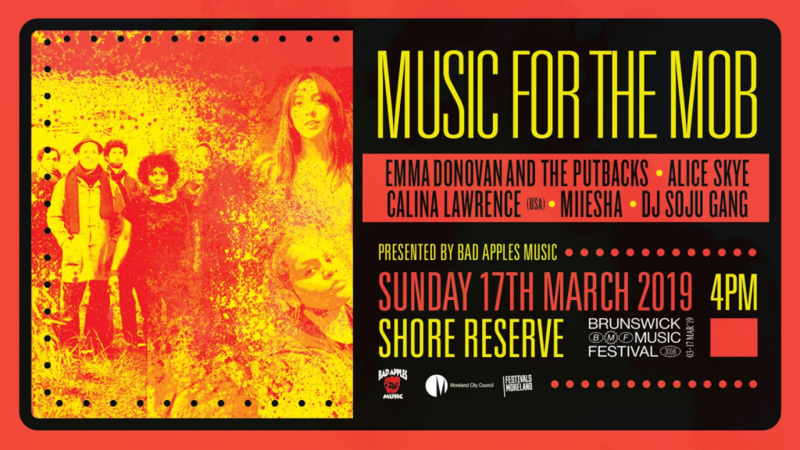 Presented by Bad Apples Music, the all female, all First Nations concert in Shore Reserve will close out the festival, seeing Lawrence perform alongside a lineup of fierce females in Australian music, including Emma Donavan and The Putbacks, Alice Skye, Miiesha and DJ Soju Gang. Last year, Bad Apples Music participated in their first cultural artists exchange when they invited Canada’s Indigenous hip hop duo, Snotty Nose Rez Kids to perform as a hip hop supergroup with Bad Apples artist Birdz and label-mate Nooky for Darwin Festival. Lawrence represents the first movement for 2019 through the partnership between Bad Apples Music and Artivist Entertainment through this artist cultural exchange. Founded in LA by Aloe Blacc, Maya Jupiter, Quetzal Flores, Alberto Lopez and Veronica Gonzalez, Artivist Entertainment is committed to supporting artists who use their creativity for positive social transformation. From promoting discussions about important social issues to sponsoring cultural events that bridge diverse communities, Artivist Entertainment shines a spotlight on activists who express themselves artistically. An enduring commitment to nurturing artists and providing platforms for excellence in the music sector, Bad Apples Music continues to grow as Australia’s most prolific Aboriginal record label. Founded by Briggs, the label maintains a foundational objective in using music as a platform for social change and educating and fostering the talent of Aboriginal and Torres Strait Islander artists. Now linking up with Artivist Entertainment to bring the inspiring Calina Lawrence to our shores, don’t miss your chance to see her, alongside some of Australia’s biggest First Nations artists when she plays Music For The Mob at Brunswick Music Festival in March.